Just a vegetarian, living in a carnivore world. I grew up in a family of omnivores, so I was raised as an omnivore. The occasional piece of bacon for breakfast, ham or turkey sandwiches for lunch, and chicken or beef for dinner. I never thought twice about it because living in the South (which I did for the majority of my childhood 10-19) you get used to hearing people taking hunting trips, going fishing and loving barbecue. Then, my senior year of high school rolled around and I was watching a documentary on tv about factory farms and I immediately stopped eating animals. My love for animals also influenced my decision. This is my cat Igor! 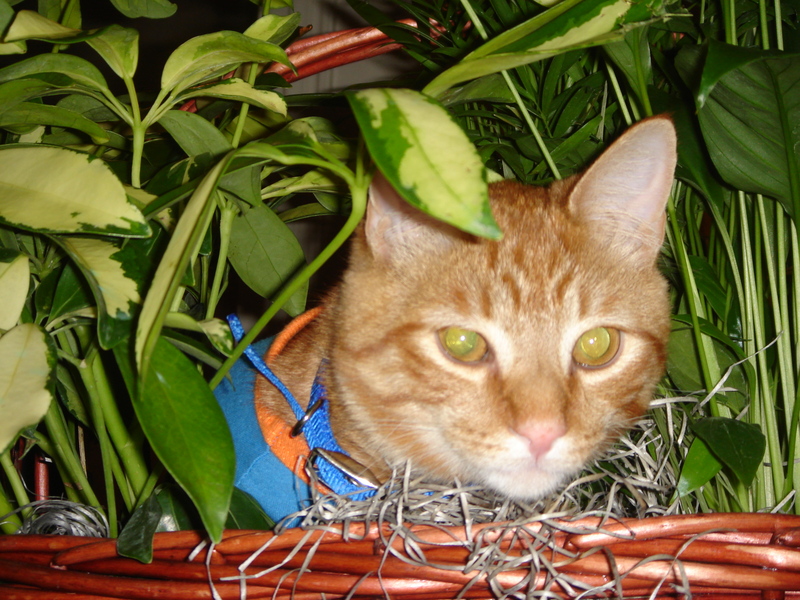 He loves to play in house plants.. weird, I know. Most people thought this was weird, I had people tell me it was stupid and crazy and ask stupid questions like “so now you only eat vegetables…?”. When I first made the switch that was probably actually true. One thing that noticed, was the lack of accommodation for vegetarians in the south. Going out to eat was not an enjoyable experience because many places, I would end up having to get a salad- without the chicken please- (insert “whaaaa? ?” from the waiter here). But although my diet choices haven’t always been easy and have been questioned by many, it has taught me to get creative with my food and to try SO many new things. Just yesterday for lunch, I had a homemade seitan sandwich and for dinner I had a moroccan spiced chickpea burger. Two things that I probably would have never considered if I were still an omnivore. I have also fallen in love with asian fare because they have so many vegetarian options. So now when people say things like “so you only eat vegetables..?” or “well where does your protein come from?” I can say that I eat whole grains, seitan, nuts and seeds, beans and legumes which are all very good sources of protein. And then the inevitable “well don’t you miss meat?” question comes. I can definitely say that no, I don’t miss meat at all. If I missed it, I would eat it because I don’t deprive myself of anything that I crave. If you are, what made you decide to make that lifestyle choice? I just recently became a vegetarian! I never ate very much meat before, and decided to finally commit in hopes that it would foster a focus on eating well balanced meals at every meal. Any tips for a noobie? Yay! I’m about to do a post on this! So stay tuned! I’ve been a vegetarian for almost 2 years now and I can honestly say I have never felt better in my life! I decided to become vegetarian for ethical (#1 reason), environmental, and health reasons (the “holy trinity” of veggie life hehe :P)! I am a huuge animal lover and just realized one day that I wanted to commit to a lifestyle that reflected that love wholeheartedly. Not only has it given me awesome piece of mind mentally and emotionally, but the physical health benefits have been amazing as well. I’ve never felt more energized and in tune with my body, and I’m going on 1.5 years without ever having so much as a cold! Now this may not be 100% because I don’t eat meat.. but I think my vegetarian lifestyle has most importantly brought an element of KINDNESS to my life that wasn’t there before. I’m kind to all living creatures, kind to the earth, kind to myself – and in turn I feel like that kindness is returned to me :D! And I’m totally with you on the being creative and trying new foods – I definitely would not have eaten half of the things that are staples in my diet now if it weren’t for me becoming veg.. it just rocked my food world! Thats such a great story! I’m glad that this lifestyle has benefitted you in so many ways! It has really made me more mindful of how I treat all living things and the environment, too. We expect the earth to do so much for us, we should at least do the best we can to preserve it!